As you get older people around you die. Then the familiar institutions go and your are to quote Robert Heinlein a Stranger in a Strange Land. This in fact is what has happened to those who once occupied a Manhattan landscape dotted with kosher delis and Cantonese restaurants which featured combination plates numbered usually from #1 to #10. #1 was always chicken chow mein, fried rice and egg roll. Sweet and sour pork, wor shu op, chop suey, lo mein and egg foo young were some of the other plats du jour. A choice of egg drop or wonton soup came as part of the deal. Jade Mountain on Second Avenue between 12th and 13th Street was a classic example of this kind of fare. The neon sign outside the building was always missing a letter so it might read “ow Mein” or “Chow ein." You sat in one of the torn Naugahyde booths or at one of the Formica topped tables in the back while a staticy radio piped out oldies from CBS-FM from the kitchen. Those picking up takeout checked in at the cash register in the front area which looked a little like a dentist’s office with its comfortable chairs, celebrity magazines and fishtank. Jade Mountain had its following, but the restaurant was closed after its beloved owner Reggie Chan was mowed down by a flatbed truck on l7th Street while making a bicycle delivery, despite the initial Times headline which read, “It’s Owner Is Mourned, but a Chinese Restaurant Goes On,” NYT, 9/17/2006). Of course if you were looking for waiters in starched white jackets who brought your Chinese food to you on China, you might have gone to Richard Mei’s King Dragon whose neon sign beckoned lovers of spare ribs and lobster Cantonese to the corner of 74rd and Third Avenue. 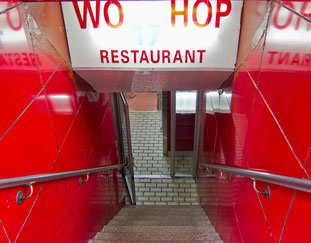 The Bobbsey Twins, Hop Kee and Wo Hop, still exist. and if you wake up in a panic into the living nightmare in which the world around you has disappeared, you can journey down to Mott Street in the heart of Chinatown, where these vestiges of a happier era await you.